Uglyworld #2174 - Really Crispyers - (Project On The Go - Image 6-365), a photo by www.bazpics.com on Flickr. Okays, I has been on my bestesters behaviours since the firsts of Januarys, and lets facers it, that was a wholes 6 daysies ago, so tonight was definitelies timer for me to has a super duper tastiers snack for dinners! "Echt Kroos", heh heh, I hopers so! 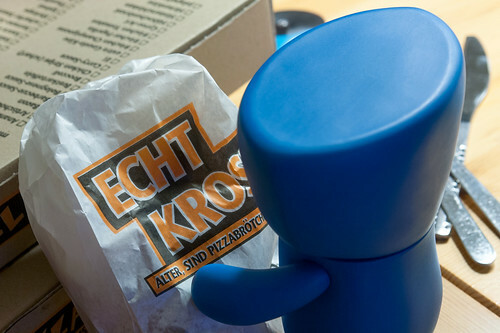 I guess I should explainers that "echt kroos" in Germans means "really crispyers" in Englishers, and basereds on whats Babo tellers me these pizzabroetchen should be scrumdiddlyuptiousers!